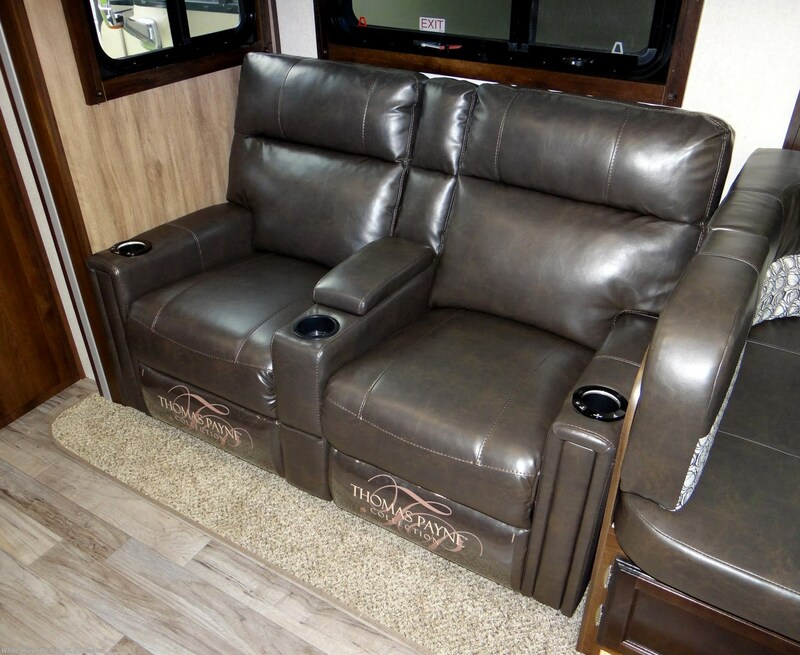 Quality time starts now! 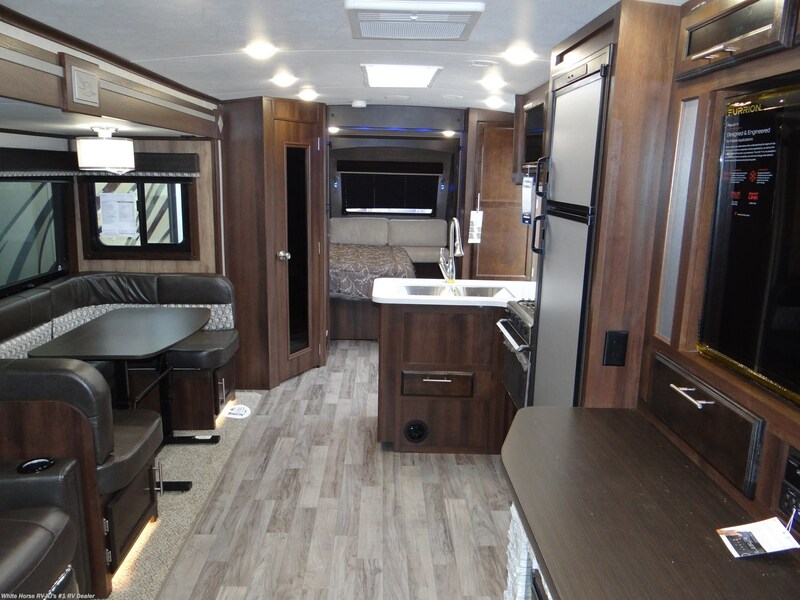 The 2019 White Hawk luxury light-weight travel trailer will help friends and family make memories that are sure to last a lifetime. 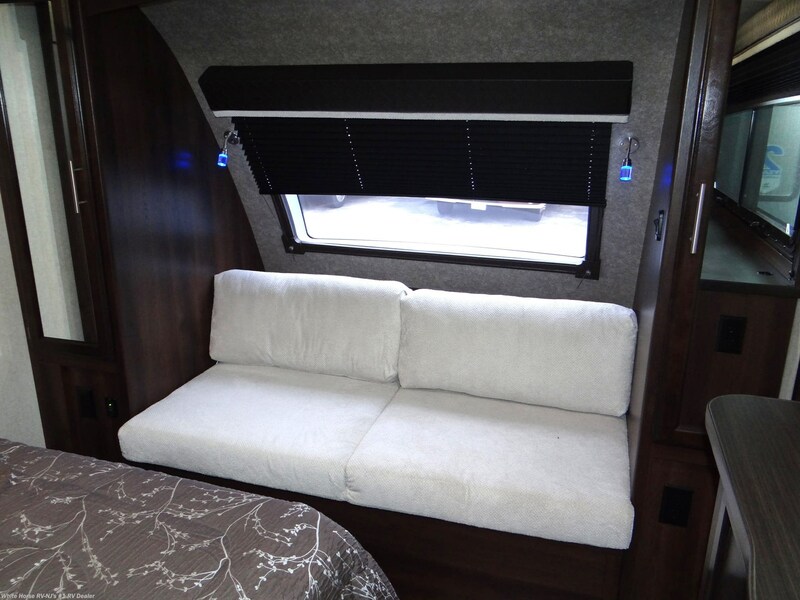 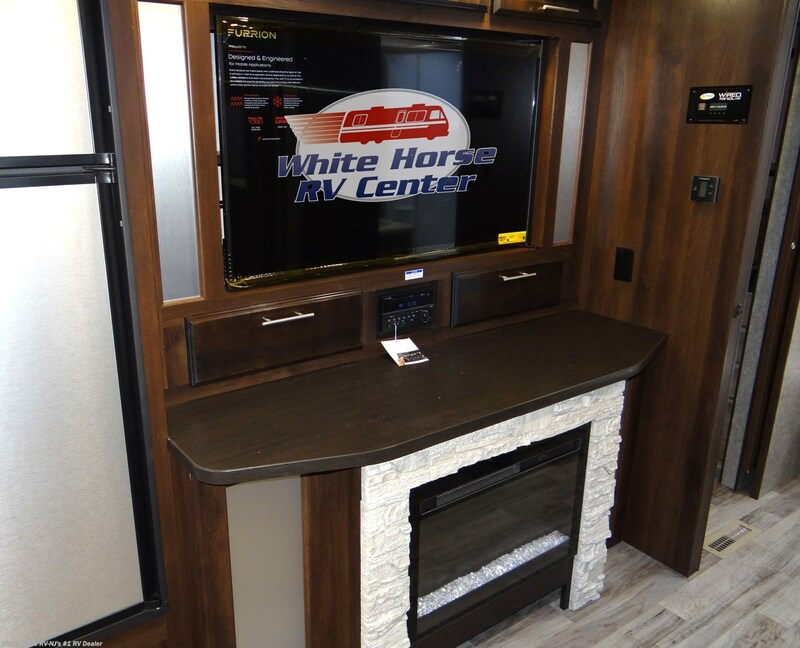 The 2019 White Hawk travel trailer features impressive 36-inch-wide, ram-style slideouts with vacuum-bonded walls, double-bulb seals and a U-channel drip spout over all openings. 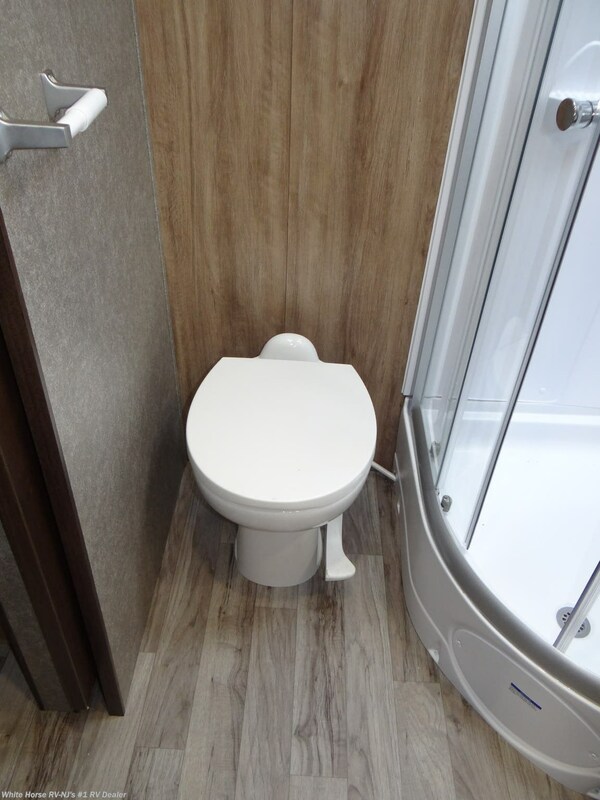 You won’t want for space—or fun—in the 2019 White Hawk Travel Trailer. 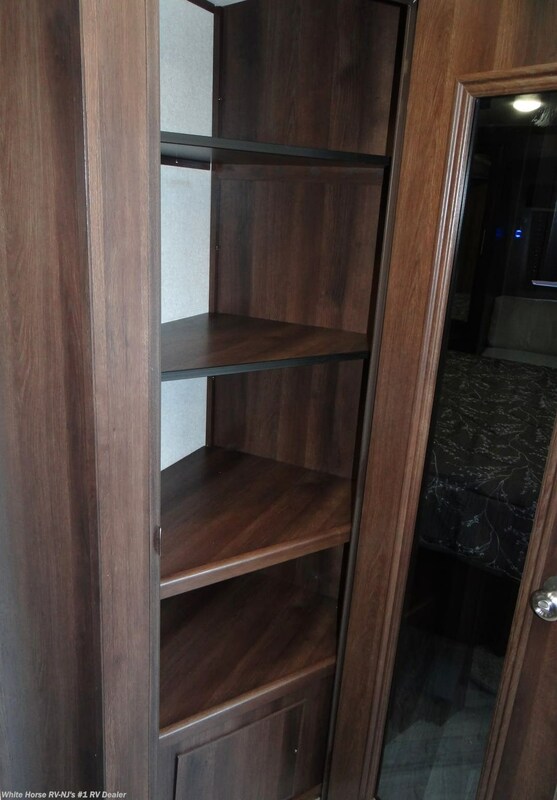 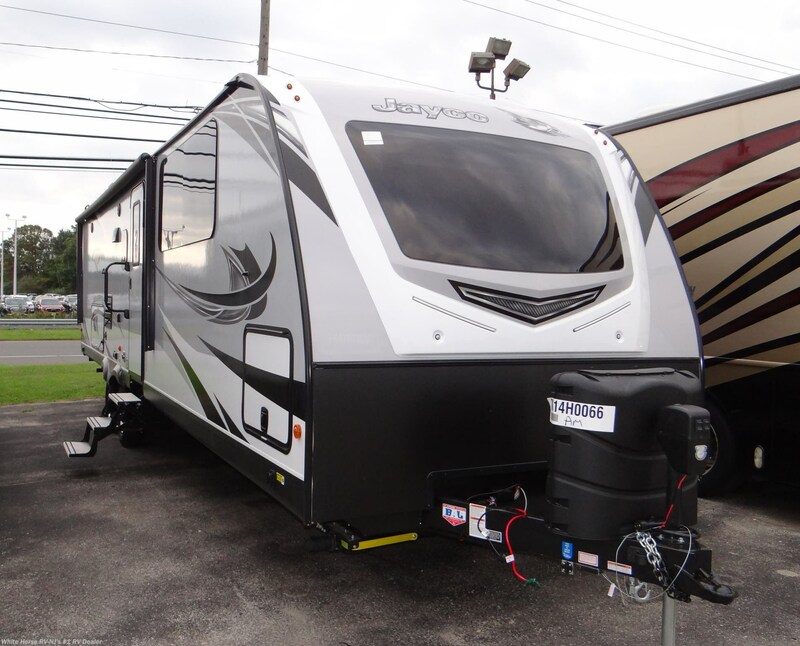 Thoughtfully designed floorplans make this line an unbeatable value. 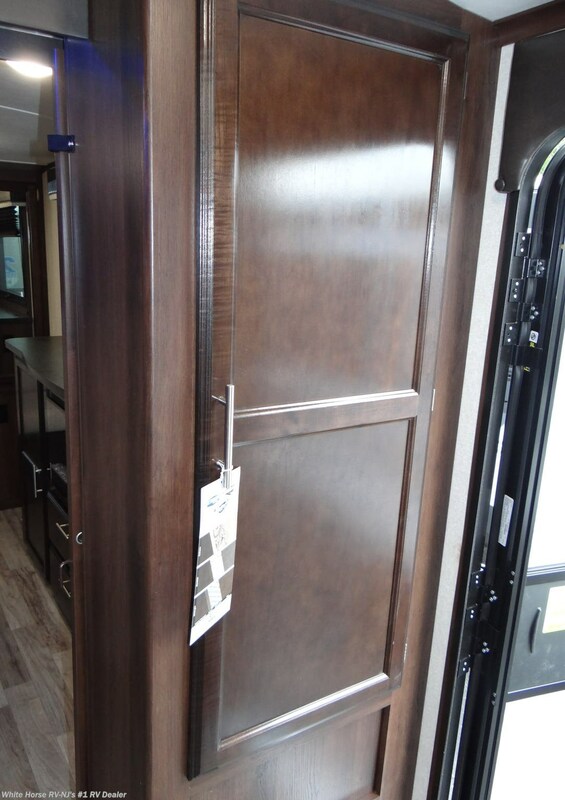 The Murphy Bed, one of our most versatile sleeping arrangements, converts into a comfortable sofa by day and queen-sized bed by night (available on select models). 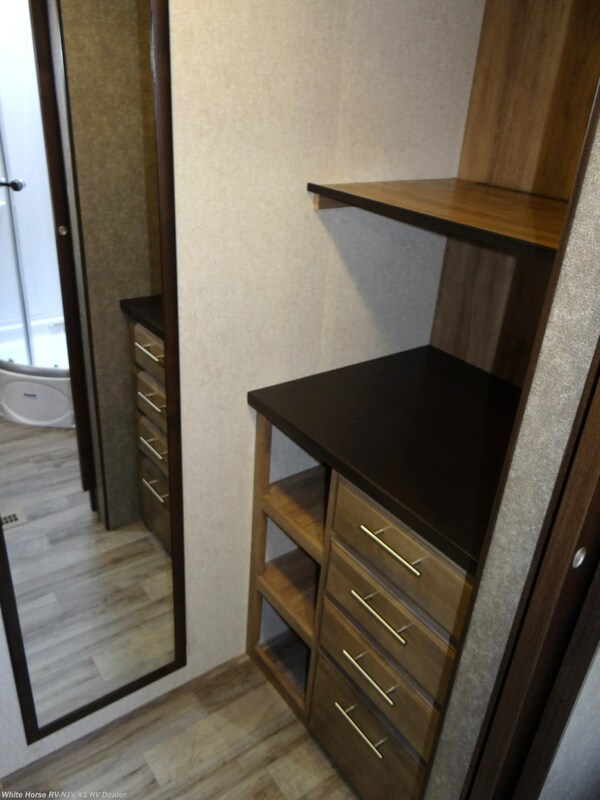 Bunk room layouts are another option to help you make the most of your recreational space. 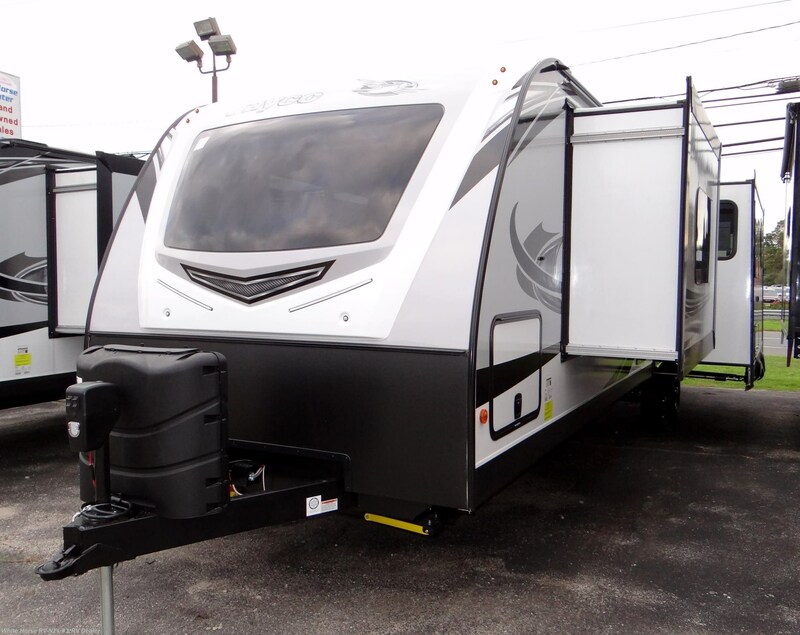 Say ‘hello’ to the industry’s strongest roof, the Magnum Truss Roof System which withstands 4,500 pounds!!! 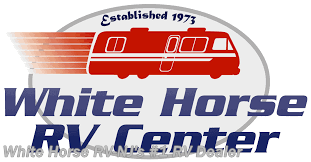 The White Hawk features ‘Tracker Wide Axles’, (which distribute weight more evenly for a smoother ride! 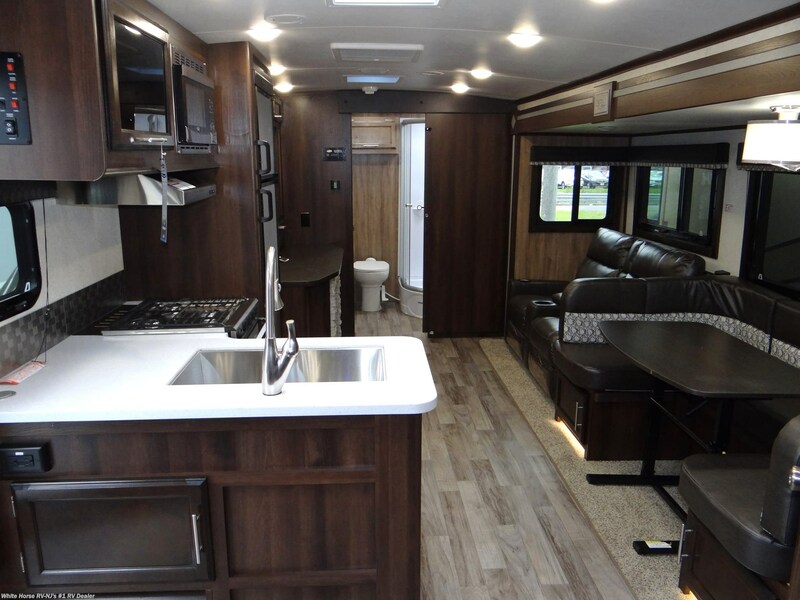 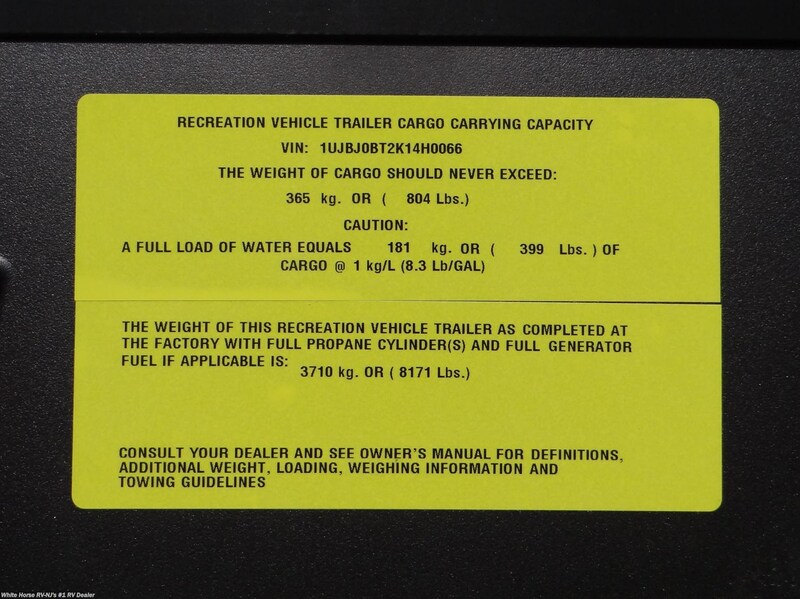 ), Heavy-Duty Fiberglass Fender, Integrated A- Frame TuffShell Vacuum Bond Laminated Sidewalls-Front Walls-End Walls-Slide Rooms, 5/8” tongue & grooved plywood flooring, fully enclosed underbelly, fold-A-Way Entry Assist Handle, 30# LP tanks w/cover, dark tinted safety glass windows, 6” Structural I-Beam, 10” entrance Steps, rubberized flexible gas lines, 75lb. 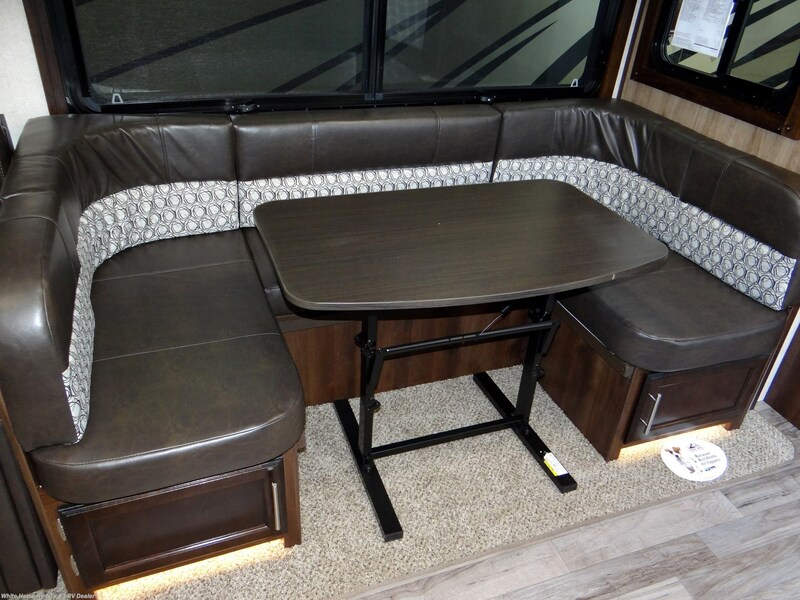 test full extension ball bearing drawer guides, pleated shades, DiamondFlor Wood-Look Vinyl Flooring, Residential-Grade Carpeting, brass faucet fittings, hardwood cabinet doors, skylight, Plywood Dinette Bed & Bunk Bases, Jayco-Made 5” Reversible Dinette Cushions--4” Reversible Bunk Mats, Hide-A-Bed Sofa, AM/FM/CD/DVD player w/Bluetooth connectivity w/Marine-Grade Exterior Speakers, large residential split bowl kitchen sink w/pull-out sprayer, Directional /Closeable A/C Vents, Full Queen Beds w/Simmons "Soft Touch” mattress & Quilted Bedspread, (except Murphy Bed models), Black Crackle Glass Inserts, Atwood Water Heater, Utility Lighting System (Entrance Step Light, Hitch Light, Baggage Compartment Light, Dump Station Light), MAX View Dinette Window and a super-handy exterior 2' x 4' exterior table, you will be completely comfortable and satisfied. 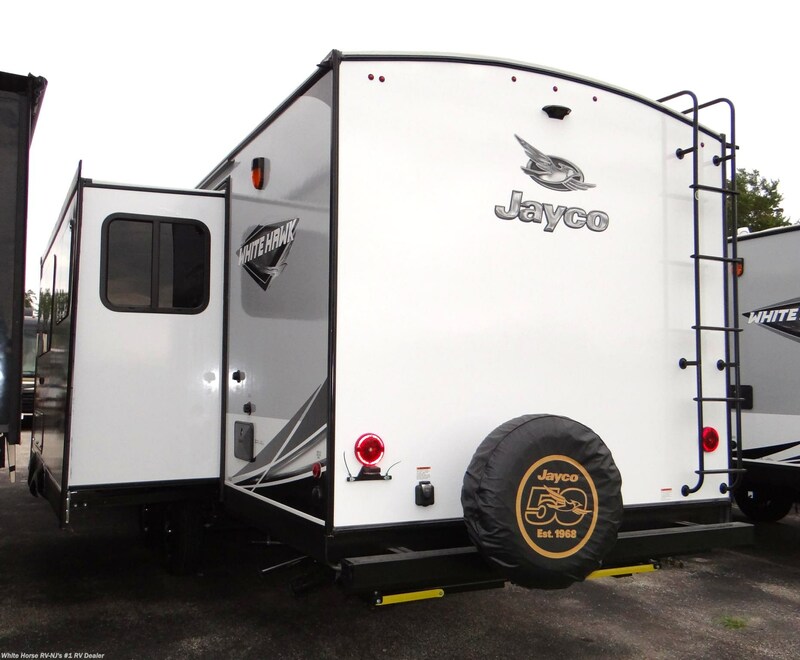 Jayco's Customer Value Package gives the White Hawk: Goodyear Tires, 13,500 BTU A/C, 30 lb. 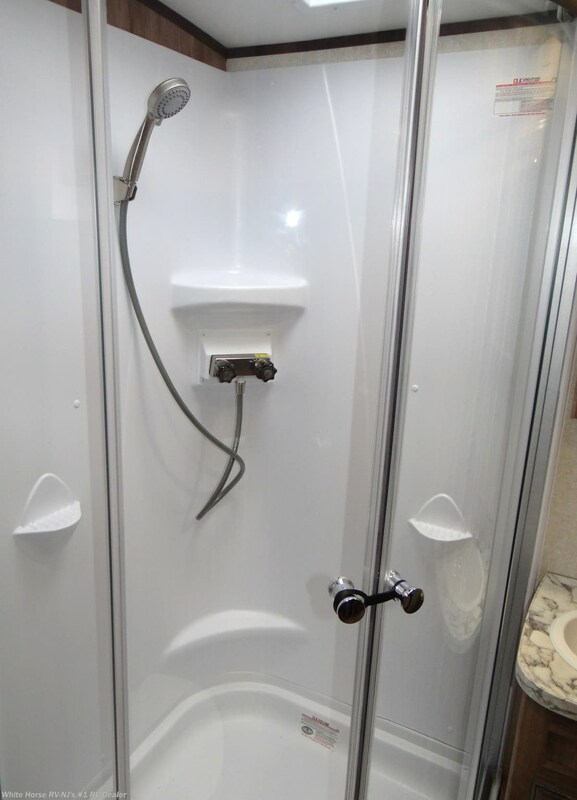 LP bottles, 34” radius shower w/solid enclosure, 40” LED TV, 6 Gal. 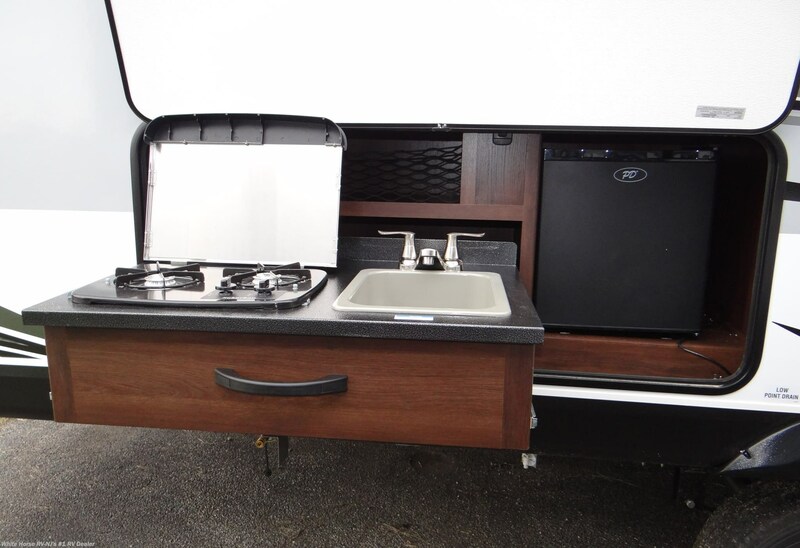 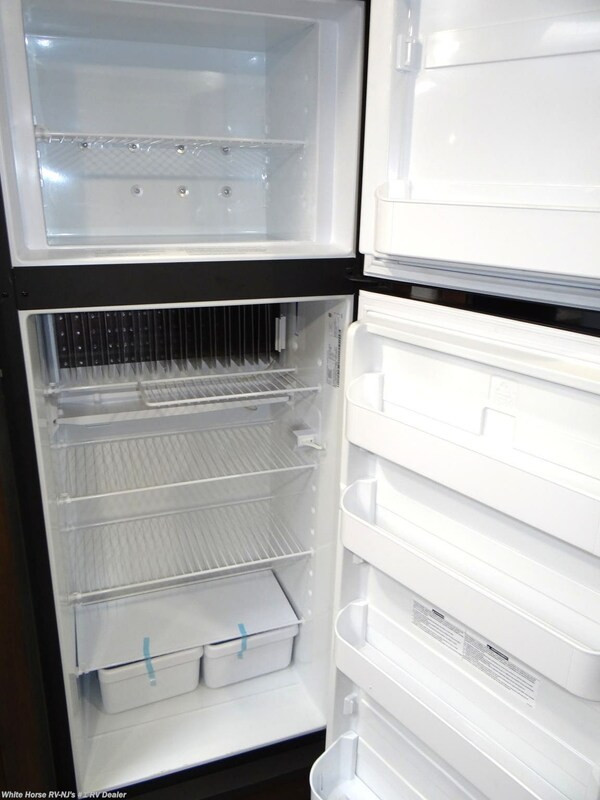 Gas/Electric Auto Ignition Water Heater, Norcold 8 cubic foot refrigerator, ABS Gas Bottle Cover, aluminum rims, bath skylight, black tank flush, detachable power cord, microwave oven, outside shower, oven, porcelain foot flush toilet, power awning w/LED lights, power tongue jack. 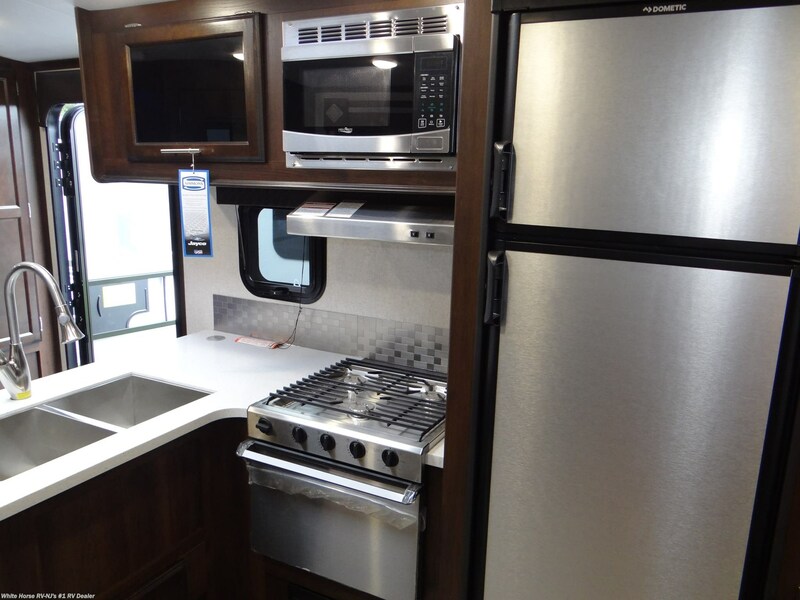 Jayco’s exclusive 5oth Anniversary Package adds: Front fiberglass cap with windshield & LED lights, frameless windows, aluminum tread steps, solid surface kitchen countertops, enclosed underbelly with Glacier package & kitchen skylight with shade. 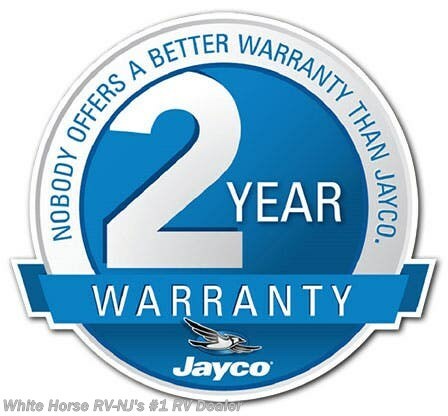 #WH12198 also has the following factory option: Fireplace, electric stabilizer jacks & Fantastic Fan,..all backed by Jayco’s industry leading 2-year warranty! 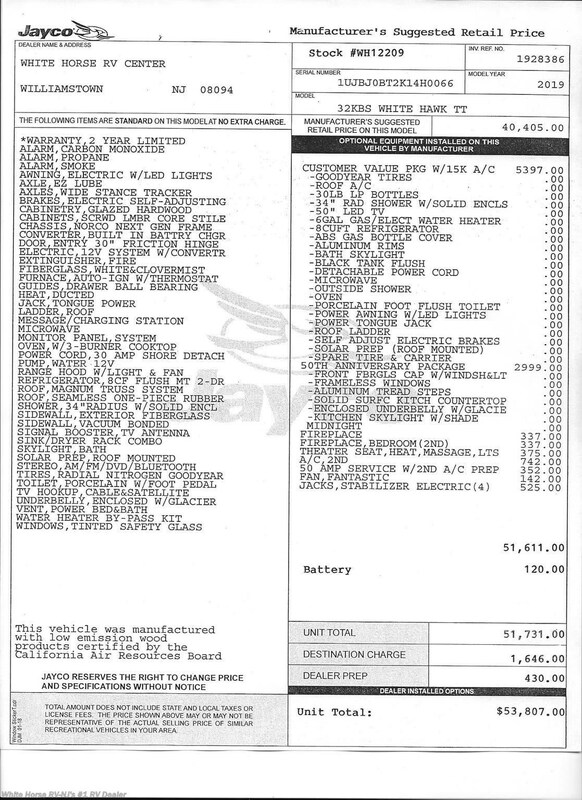 MSRP $49,711. 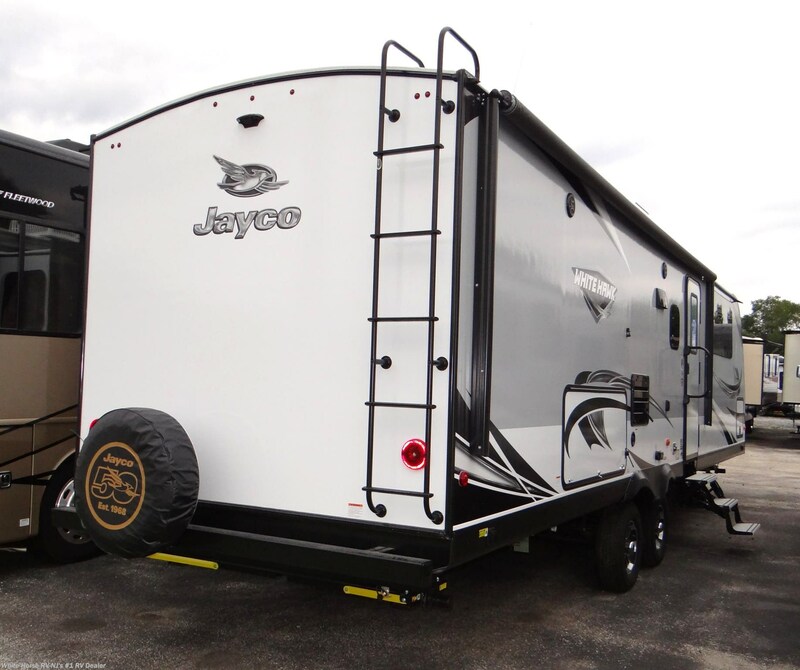 The all-new 2019 Jayco White Hawk Ultra Lite points the way to good times ahead in the great outdoors! 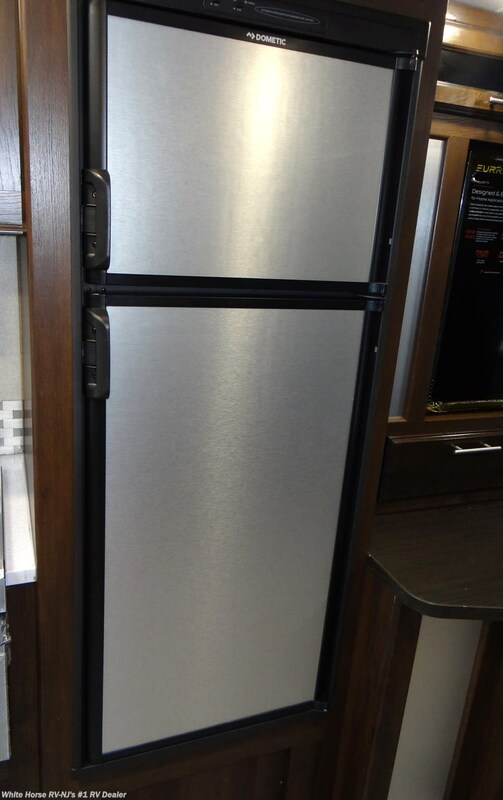 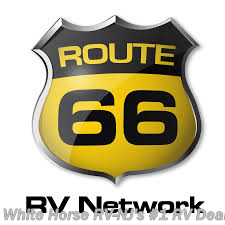 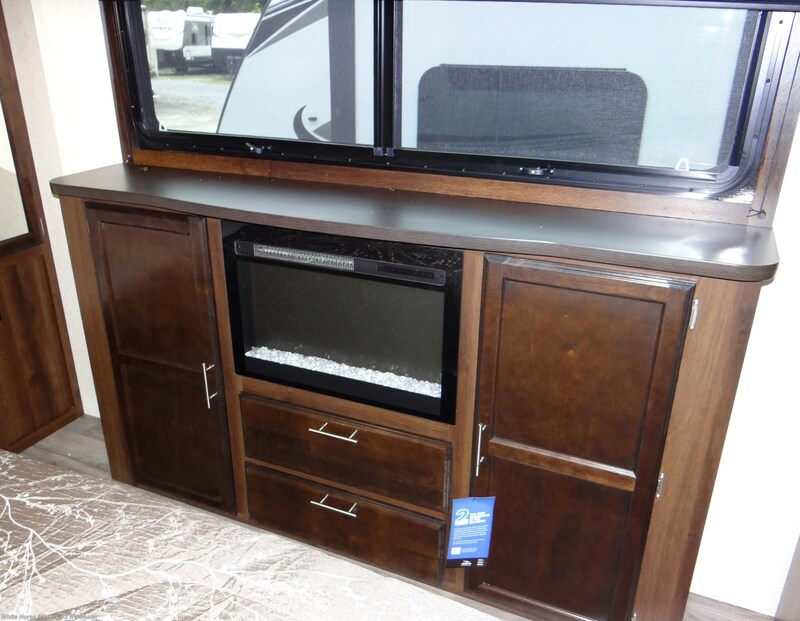 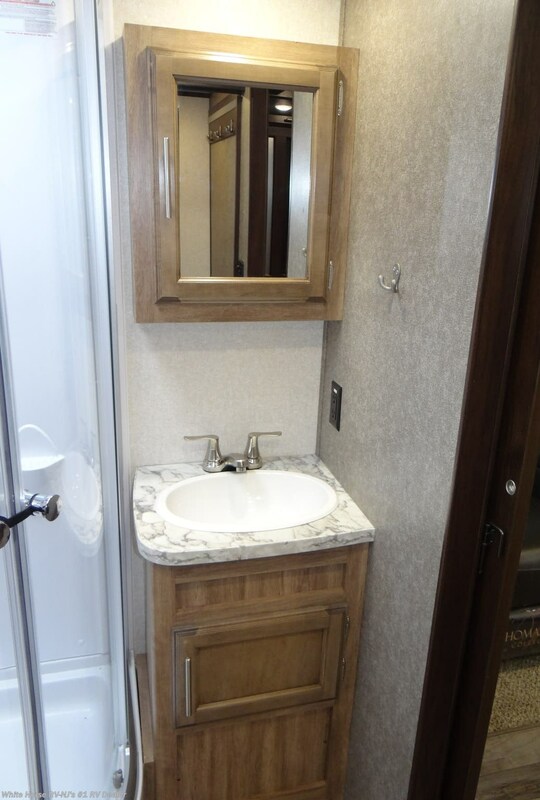 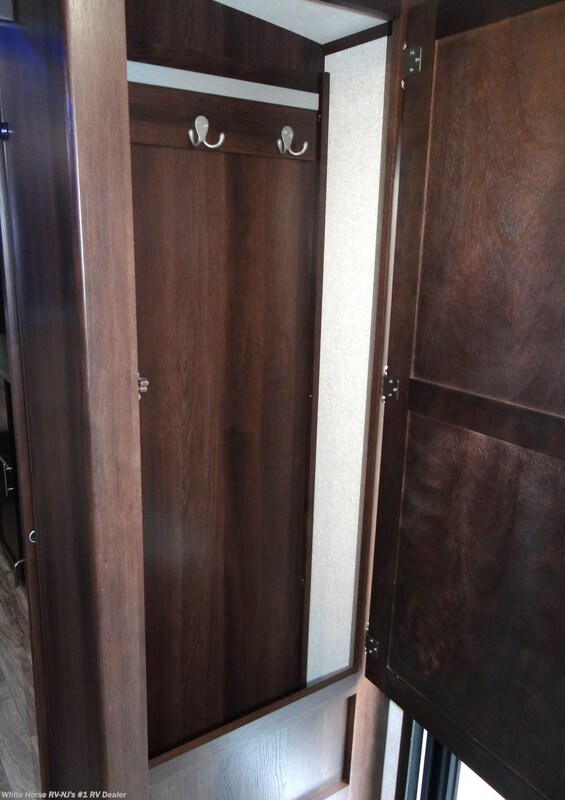 See this Stock # WH12209 - 2019 Jayco White Hawk 32KBS Rear Bath, King Bed Double Slideout on White Horse RV Center! 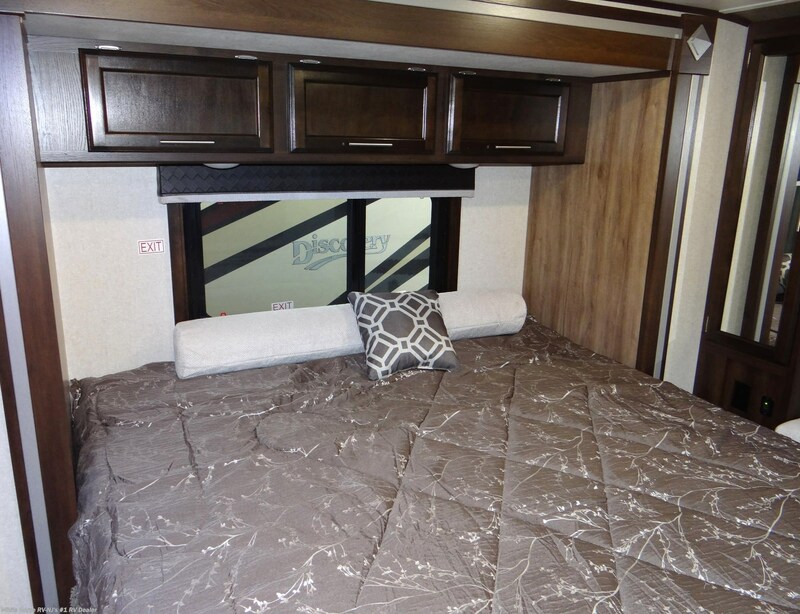 Check out Stock # WH12209 - 2019 Jayco White Hawk 32KBS Rear Bath, King Bed Double Slideout on jaycorvsource.com!